This Friday released the much-anticipated Hindi romantic drama, Luka Chuppi is running tremendously at the box office. Starring the very talented Kartik Aaryan and Kriti Sanon in lead roles. Being the much-anticipated release, director Laxman Utekar’s Luka Chuppi has got succeed to hit the target right as expected and received mostly positive reviews from the critics as well as the audience across the country. Presented by Maddock Films, this romantic comedy Luka Chuppi was released amid the great buzz and expectedly took a good start. Over the weekend, it remained super-strong and did the business of 32.13 crores with 8.01 crores on Friday, 10.08 crores on Saturday & 14.04 crores on Sunday. On Monday due to a holiday, it got an almost similar response as of Friday and minted the amount of 7.90 crores, while scored 5.04 crores on Tuesday. On the next day i.e. Wednesday, Kartik-Kriti starrer minted 4.60 crores and raised 6 days total domestic collection to 49.67 crores from 2100 screens. 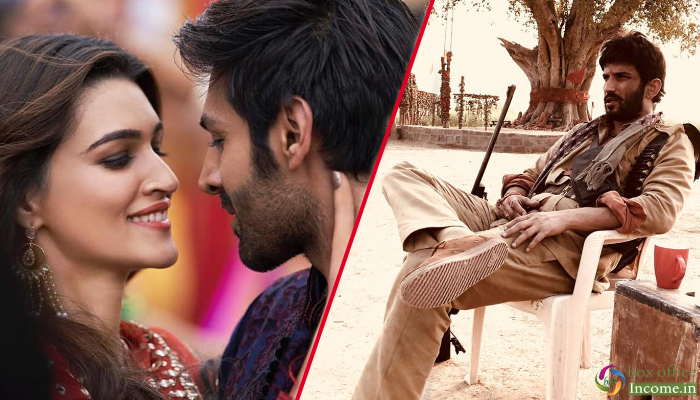 While the adjacent release, Abhishek Chaubey’s Sonchiriya has also received positive reviews from the critics but unfortunately not getting the desired response at the box office. In the opening weekend, it did the business of 4.60 crores with 1.20 crores on Friday, 1.50 crores on Saturday & 1.90 crores on Sunday from 720 screens across India.